You couldn’t make it up. 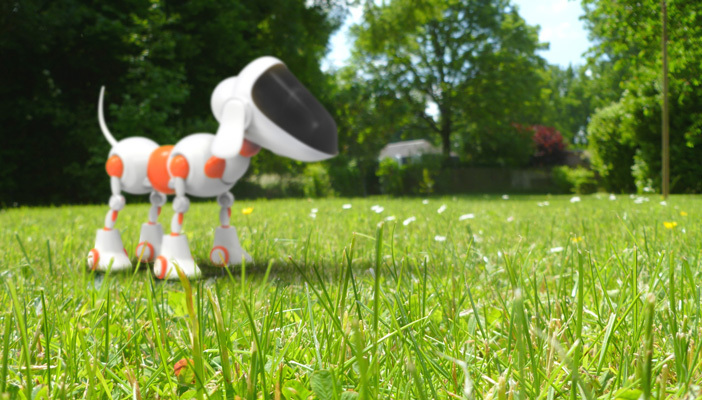 Could a 'robotic dog' really replace a cute little guide dog? It is hard to imagine, but research suggests otherwise, thanks to revolutionary reins that enable robots to act like guide dogs. The small mobile robot – equipped with tactile sensors – has the potential to guide people with sight loss as well as firefighters in challenging situations. For example a firefighter would follow a metre or so behind holding a rein. The robot would help the firefighter move swiftly in hazardous conditions, especially where smoke is affecting visibility, while vibrations sent back through the rein would provide data about the size, shape and even the stiffness of any object the robot finds. The project has been developed by King’s College London and Sheffield Hallam University, with funding from the Engineering and Physical Sciences Research Council (EPSRC). Project partners have included the charity Guide Dogs. The team now plan to build a prototype. The team has developed a tactile language for using robotics in a number of domestic scenarios and now plans to explore how reins and haptic signals could help older people in their homes. A guide dog is so much more than a mobility aid. When they’re not working they behave just like a pet dog and are adored by their owners and show love in return. There are many people with sight loss who rarely leave home on their own and many more who say they feel cut off from the people and world around them. A guide dog is a companion who provides company and friendship as well as assistance. A guide dog isn’t just there to support its owner; guide dogs become part of the family and are adored by everyone. Have you tried? It’s nowhere near as soft and warm as our pups. The charity has trained guide dogs for more than 80 years and the techniques are pretty advanced. Guide dogs are bred for their exceptional attributes that make them among the most loyal and trusted canine companions in the world. There’s no denying that robots are pretty cool, but they are far less cute when you rub their tummies! While the robots aren’t yet able to tackle steps, guide dogs are experts at getting about. They also receive special, advanced training to support their owners’ unique lifestyles. Guide dogs help people from urban London to the Scottish highlands. A guide dog and their owner have a truly unique partnership that is built on trust and understanding. Guide dogs can learn a huge amount about their owners from their height to their length of stride. Guide dogs don’t run out of batteries so they’ll never leave you stranded. *The image features is not the robot referred to in the story.